Security was tight as oil ministers from the Middle East and CEOs from the largest oil and gas companies and electric utilities rolled into Texas in mid-February to present new ideas, defend agendas, and just mingle. More than 1,200 delegates from 55 countries heard more than 100 distinguished speakers discuss topics ranging from carbon abatement programs and the nuclear renaissance to utility-scale renewable technologies. Undeniably, the market downturn, tight money supply, and its effect on new plant construction was the central theme of the conference, even if the topic wasn’t formally placed on the agenda. The theme for this year’s CERAWeek was "Risk and the Rebuilding of Confidence: Energy Strategies for a Turbulent Economy." The global recession was the uninvited 800-pound gorilla in the room that everyone pointed at and talked about. But no one had any idea how to ask it to leave. Regardless of one’s political stripe or environmental leanings, when money is tight, there can be no advance of any agenda. Utility senior manager uncertainty is the logical result of market and regulatory unpredictability, but now it is exacerbated by global competition for limited supplies of fuel and raw materials. The first three days of the conference focused on worldwide supply and demand for oil and natural gas. Days four and five were dedicated to electric power, beginning with a keynote address by Fred Krupp, author of Earth, the Sequel: The Race to Reinvent Energy and Stop Global Warming. Krupp describes himself as a "nonideological environmentalist" who also happens to be president of Environmental Defense Fund and a spokesperson for United States Climate Action Partnership (USCAP, www.us-cap.org). USCAP is an association of 26 large U.S.-based corporations and four environmental groups that have drafted a "blueprint" for federal cap-and-trade reduction of greenhouse gas (GHG) legislation. The USCAP blueprint calls for GHG emissions reductions of 20% from 2005 levels by the year 2050, and intermediate targets as early as 2012, but for reaching those goals in an economically responsible manner. Krupp acknowledges that coal has a place in the nation’s energy mix going forward but tempers that statement with another: "Until there’s money to be made by keeping CO 2 out of the atmosphere, no one will build CCS [carbon capture and sequestration]." Krupp went on to state his belief that federal cap-and-trade legislation is inevitable this year and that a proper mix of environmental strategies can lead the nation’s economic recovery. He also believes that "the climate change challenge will create more economic opportunities than risks for the U.S. economy." Not everyone was buying what he was selling. What will be the form of the U.S. carbon-trading scheme? Will carbon reduction legislation be passed in the U.S. this year? How much will this legislation add to the price of electricity, natural gas, transportation fuels, and other products that depend on these fuels? Several panelists suggested that a federal tax on carbon would be much less complicated than a cap-and-trade system and would provide needed market certainty for utilities and others that have a fossil fuel – based business. Others argued that cap-and-trade is more efficient at reducing greenhouse gas emissions. Why? Because all of the money collected in the sale of carbon offsets and allowances act as incentives for investment in climate control. If the federal government merely imposes a tax, chances are that that tax money will be an easy target for politicians eager to tap the fund for other government programs and general revenue purposes, much as with the abuse of our social security system. The consensus at CERA was to expect cap-and-trade legislation to become the law of the land during late 2010. Also, expect China to participate in the next round of global climate change policy discussions during the December 2009 environmental summit in Copenhagen. 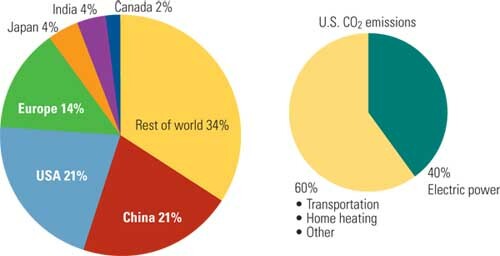 According to CERA data, the U.S. and China are each responsible for about 21% of the world’s CO 2 emissions (Figure 1, p. 61). However, during the next decade, China is set to become the world’s runaway leader in carbon emissions, thanks to a massive program to construct 800,000 MW of coal-fired generation; that’s two and one-half times the current installed base of U.S. coal-fired power plants. How much will electricity prices rise in the U.S. with a cap-and-trade scheme in place? Massachusetts Institute of Technology scientists estimate that using current production costs and a carbon price of $85/ton, the incremental bus bar cost of electricity will increase 1.5 to 2.0 cents per kWh for an integrated gasification combined-cycle or natural gas combined-cycle plant and 3.0 cents per kWh for a pulverized coal plant. This translates into an increase in consumer electrical rates in the range of 33% to 75%. Lawrence J. Matkovich, CERA vice president and senior advisor, had his own quantitative summary: "A tax of $30 per ton of CO 2 would increase the price of electricity by approximately 11% and decrease demand for electricity by 6% in conjunction with a 7% decrease in the CO 2 emissions from the U.S. power industry." The impact on other consumer costs for products that are fuel-intensive in their manufacture was not discussed. Utilities, regulators, and environmentalists all agree that improving our nation’s energy efficiency is imperative. Where they disagree is over how those who invest in energy efficiency projects are reimbursed or earn a reasonable profit. Only 30% of Americans today consider climate change a priority and are more focused on the economy. Utilities are more informed technologically about efficiency. Utilities have a lower cost of capital. Izzo’s rationale for utilities entering the energy efficiency market avoided mentioning the fact that utilities do not have experience in this market, heretofore served by any number of private firms with expertise across industrial and commercial industries. The question is this: Should utilities have the opportunity to invest in energy savings projects that benefit particular customers, yet have those investment dollars added to their ratebase, which determines their annual earnings? In essence, some customers are being asked to subsidize energy conservation projects that do not directly reduce their home utility bill. You can’t blame Izzo for trying to stake out areas where he can grow his business, but the idea isn’t getting much traction in local public utility commissions. Other speakers representing electric utilities expressed concern about the economy’s nosedive and have cut their capital budgets by 15% or more for 2009 and deferred many projects from one to two years. The surviving projects are generally related to transmission and distribution system improvements, which are considered safer investments by utilities. The discussion also revealed that many utilities still have plenty of cash available for investment — up to six times their current capital budgets — if consistent and appropriate regulatory reforms are made that will ensure an adequate return on their investment. Freezing rates, as some states have done, is a sure path to reduced infrastructure investment. Here’s the point: Finding financing for projects is tough these days, but the U.S. utility industry is relatively healthy and can fund (or raise funds) for investment in infrastructure if the regulatory climate ensures a realistic rate of return. Electricity use in the U.S. has risen every year except 1974, 1982, 2001, and 2008. Each of these years coincided with an economic recession; usage immediately rebounded and grew the following year. The current economic recession seems to be more severe than the three previous ones, and the Energy Information Agency (EIA) is predicting that consumption of electricity will fall by 0.8% in 2009 and then rebound by 1.3% in 2010 (Figure 2). If this occurs, it will be the first time in history that U.S. electricity consumption has fallen two years in a row. Utility executives attending the CERA conference were less optimistic than the usually overly optimistic EIA reports. Most utility executives surveyed predicted that 2010 consumption would be less than 2009’s. If they are right, electricity usage would fall for an unprecedented three consecutive years. Let’s put these numbers into a more global perspective. The rest of the industrialized world is experiencing an even greater drop in electricity consumption. Why? Because residential customers consume more than 40% of all kilowatt-hours produced in the U.S. — a higher fraction than in any other industrialized nation, where the largest usage reductions are in the industrial sectors. Take China as an example of a developing nation. In China, industrial customers consume nearly 80% of all electricity. 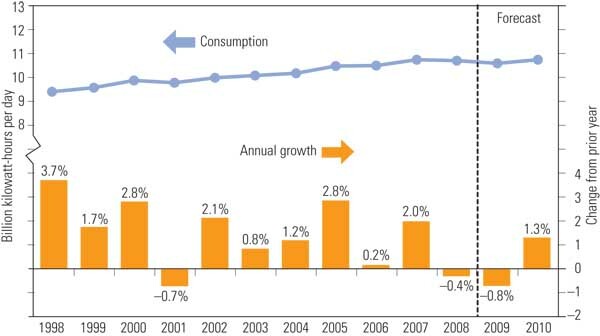 During the last three months of 2008, total consumption of electricity in China was down 6% (versus 2007) driven by a double-digit fall-off in industrial consumption. Likewise, in Russia, where industry consumes about 50% of electricity, total consumption in 2008 Q4 was off 3%. In Italy, overall consumption was down 10% in January 2009 compared to December 2008, after a fall of 0.7% for 2008 — the first annual decrease since 1981. In France, industrial customers used 18% less electricity in December 2008 than in December 2007. German mega-utility RWE predicts that energy-intensive industrial customers will consume 10% less electricity in 2009 than in 2008.